The steel factory was abandoned in 1985, leaving behind an assortment of monstrous structures and polluted soil. 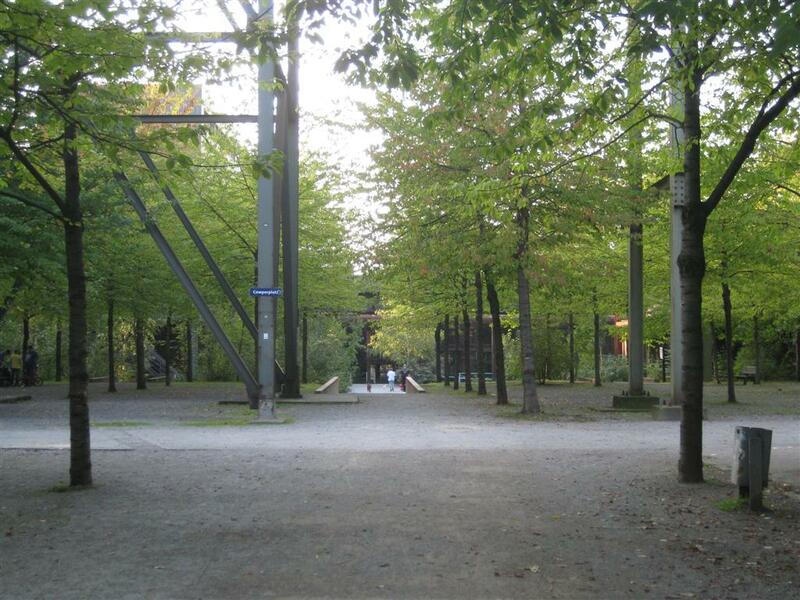 The transformation into a public park was initiated in 1991, and was carried out by landscape architect Peter Latz, of the firm Latz + Partner. 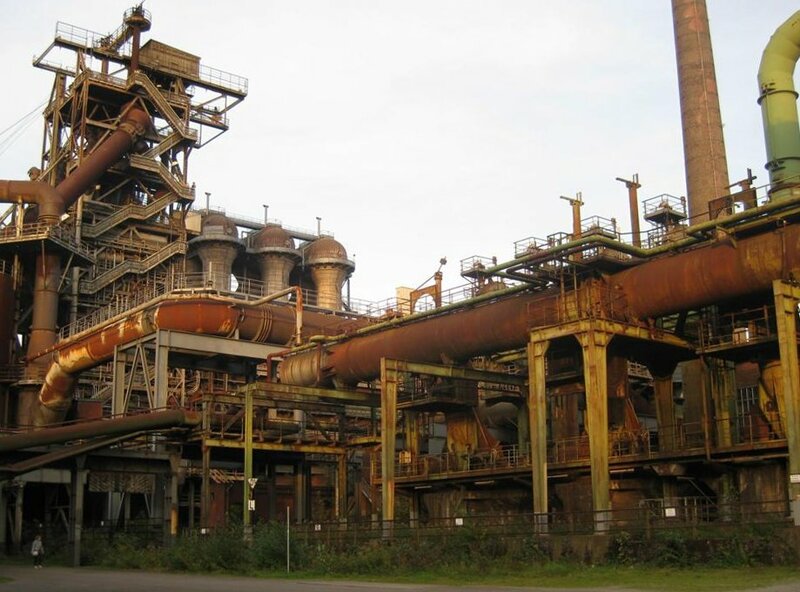 Unlike other proposals that were made for the site, his aimed to keep most of the existing buildings, and use them to illustrate and understand the industrial past rather than cover it up. 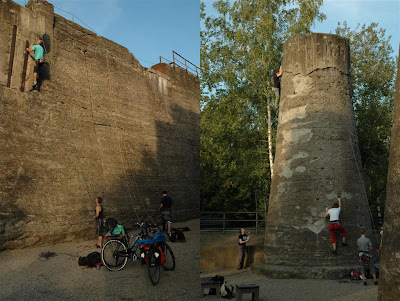 As a result, everything has been left in place: the gigantic factory buildings, concrete storage bunkers of mammoth proportions, pools and canals, and the old railway. But everything has been put to new and often unexpected usage. The factory buildings themselves provide the dominant theme for the park. 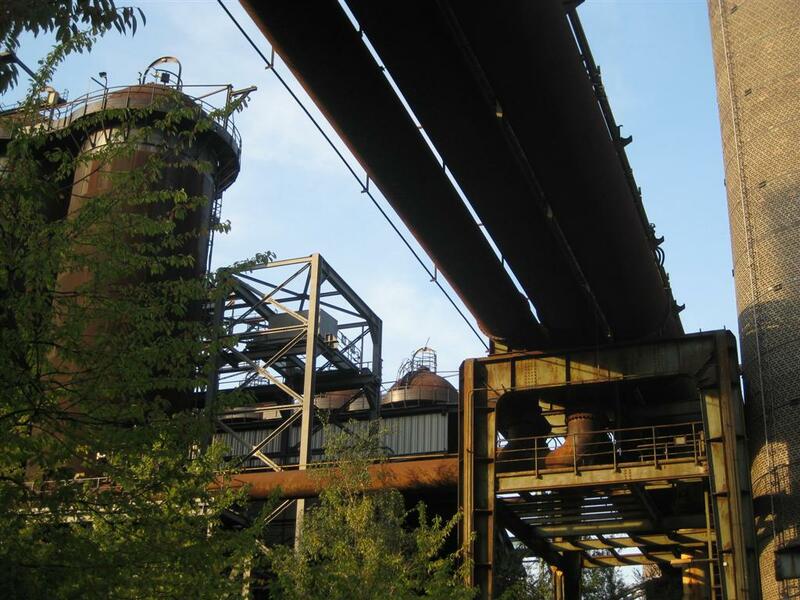 They are in a perfect state of romantic dilapidation – rusted, cracking at the joints, and with signs of nature’s reclamation sprouting up everywhere. 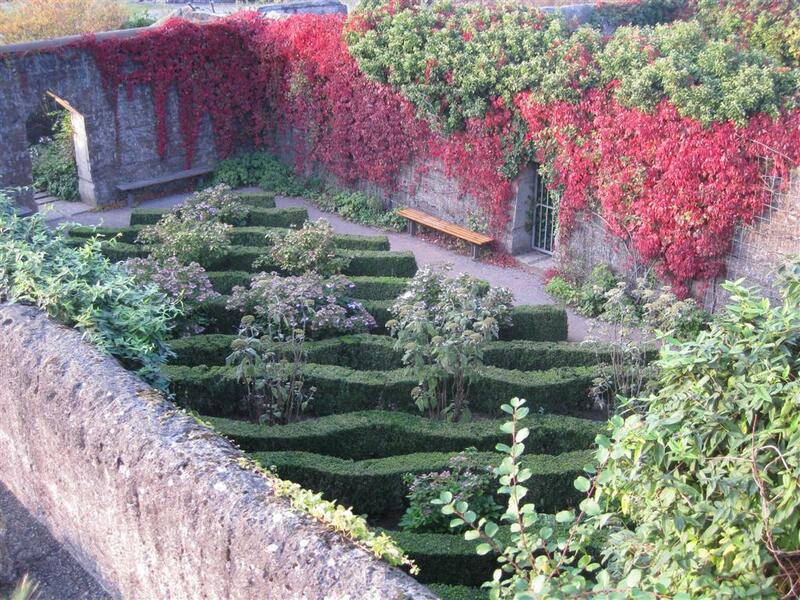 Access is allowed into several buildings through narrow and steep stairways that lead to a labyrinth of dark walkways. A little unsettling to a North American used to overly tight safety regulations. The edgy industrial feel of these buildings seemed to appeal to two groups in particular: teenage rock bands looking for a backdrop for their bad-boy cover shots, and well-equipped amateur photographers. You could find plenty of both hidden in the most unexpected dark recesses of the buildings. 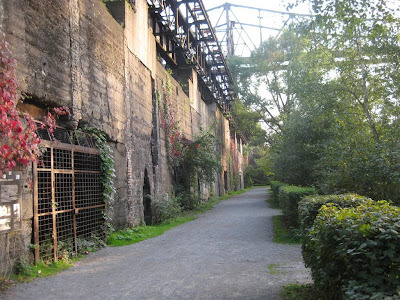 The great concrete bunkers and various concrete storage structures that surround the factory buildings were also left in place. 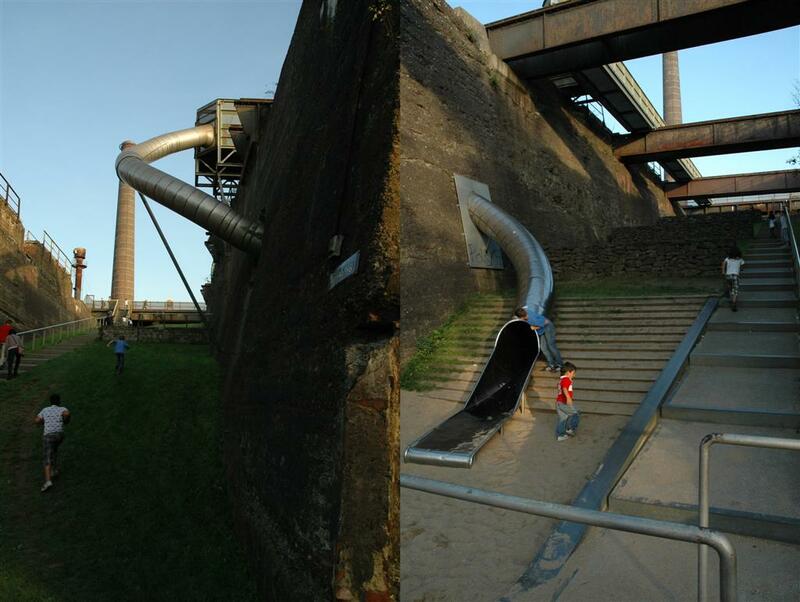 They are now put to creative use either as playgrounds featuring gigantic sand boxes and twisting slides, or as climbing walls. As a climber myself, the latter was really nice to see. And very tempting since the climbing rope happened to be in the car! All this is well enough, but what about the green stuff that usually goes in parks? I think Richardson already described the approach perfectly when he said the “lightest of touches” was used. Most of the greenery seems to be whatever happens to grow there - it's hard to tell what was planted and what was already found growing at the abandoned site. There are a few exceptions, such a simple geometric planting of trees at the entrance to the park, and some pruned hedges here and there to punctuate the chaos. 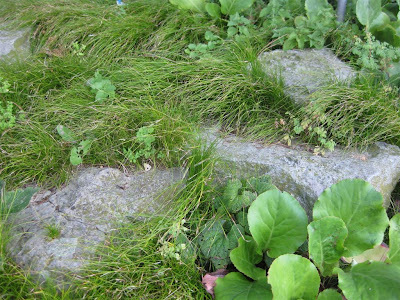 The soil was quite polluted, but Latz chose not to replace it. Instead, the very fancy-sounding approach of “phytomediation” was taken, meaning that the soil was left in place and plants are now used to do the rehabilitation work. 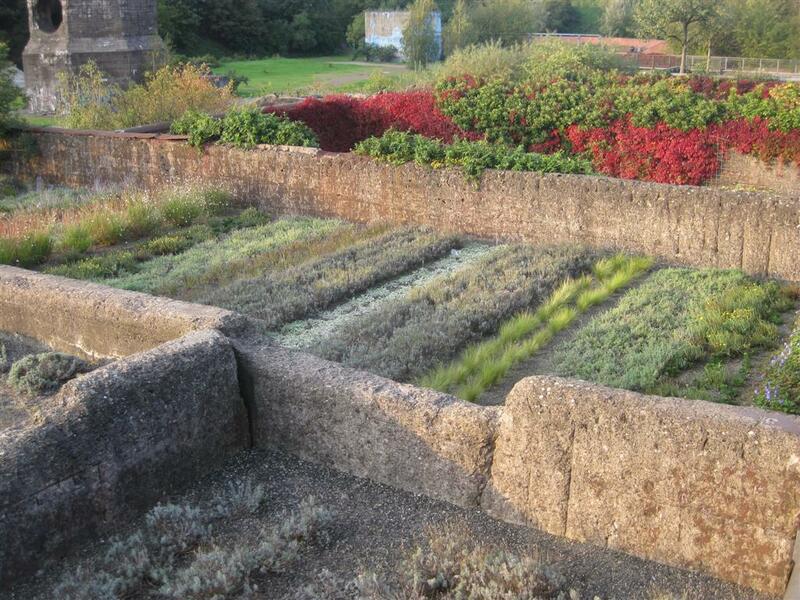 Perhaps what seemed like a mess of random vegetation is actually a carefully chosen mix of soil detoxifying plants? The only more ‘gardened’ area, if one can call it that, is across from the factory buildings on the other side of the canal. Here, there are a series of gigantic concrete bunkers, which look like boxes with no tops. There is an elevated walkway which allows visitors to look into the boxes from above. 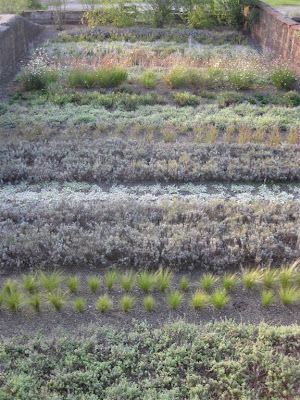 Given the viewpoint, the planting patterns are kept simple and obvious. Several boxes are planted with straight rows of identical plants, which I thought worked quite well. In one box, the only one you can actually walk into, tightly clipped hedges were used to create a strong geometric pattern which was both striking from above and effective below. Although the hedge pattern is not classical, the garden contained mostly traditional plants, such as roses and hydrangeas. 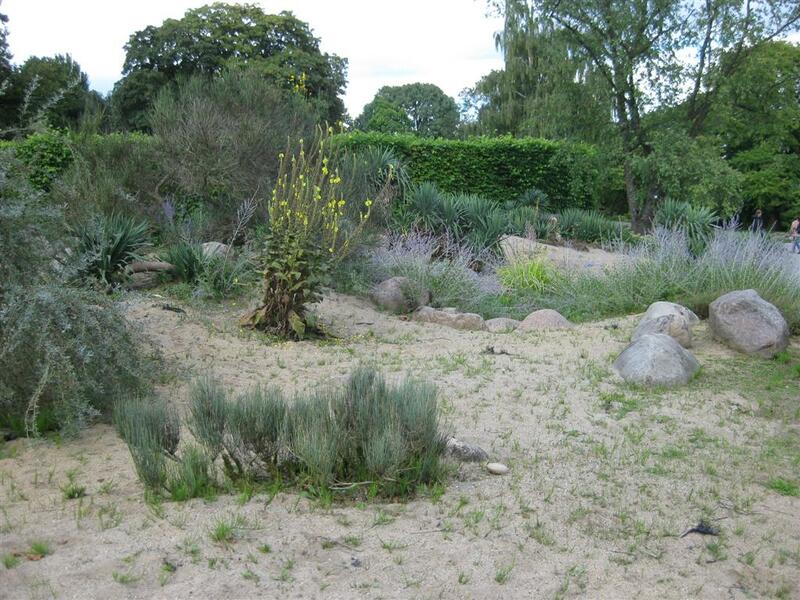 The Duisburg Landschaftspark is certainly a very interesting experiment, and a park unlike any I have seen before. But personally, the feeling I got walking through it was one of uneasiness, of being on edge. 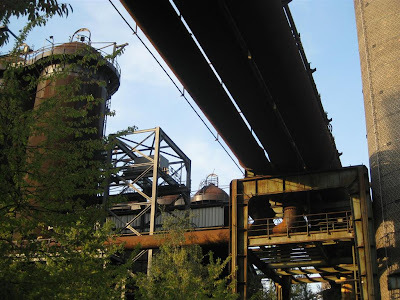 There is no sugar coating the industrial history here, no softening of the landscape with pretty plantings. Certainly many elements are original and may provide important inspiration for the future. But to me, it felt a bit like a very modern house – nice to see and visit, but just not comfortable to live in. Hurray - my first review for thinkinGardens has been posted! I'm very excited that Anne Wareham found it worthy, and curious to see any comments. 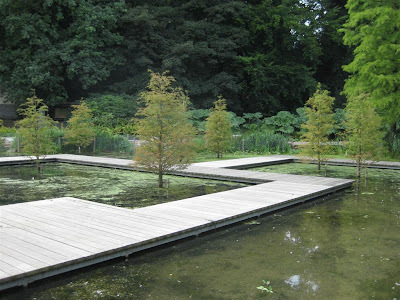 The post is a bit of a rant on the problems with show gardens, based on my visit to Appeltern in the Netherlands, a massive permanent exhibition ground for model gardens. It's a place I was excited to visit, but it completely turned me off show gardens. 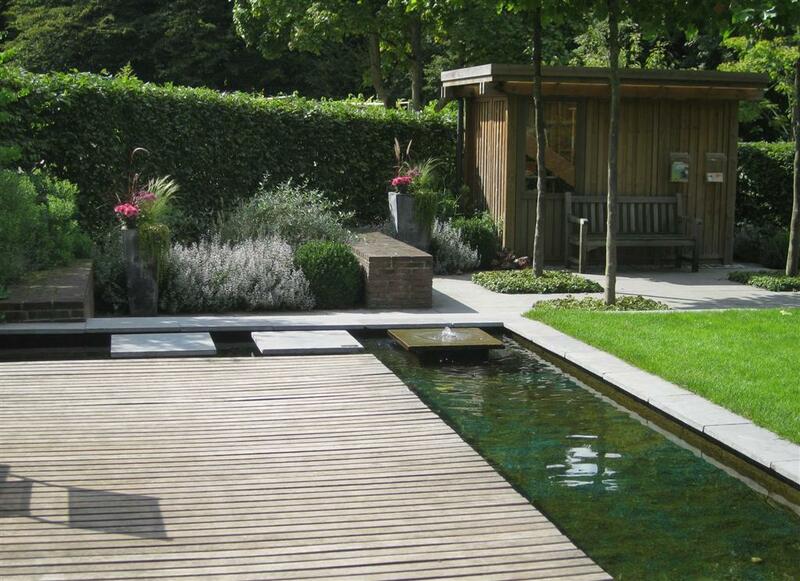 Perhaps others will have some thoughts on why show gardens don't often satisfy, or maybe why they think they do? 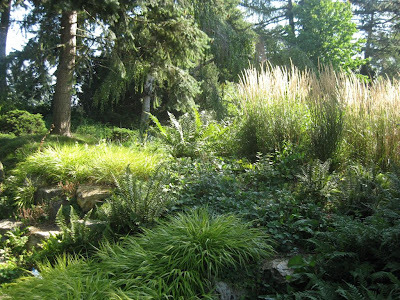 I visited the Grugapark just outside Essen in south-west Germany based on Noel Kingsbury’s list of recommended gardens. As the list is very short and select, and includes Hermannshof and Westpark in Munich, I had high expectations. Unfortunately, this was the first garden that disappointed in Germany – it definitely doesn't deserve its place of honour alongside the other names. The first difficulty with Grugapark was finding it – following Google directions, we first ended up at an impressive hospital in the middle of a forest with absolutely nothing else around it... surreal. A lot of broken German and driving in circles later, we finally found signs for the park, but it was still a while before we hit on a real entrance. 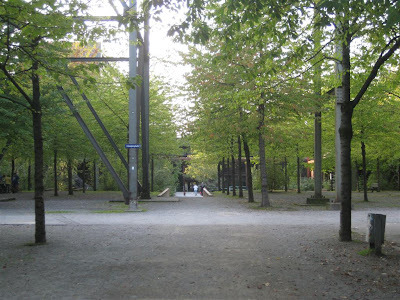 Grugapark is an extensive public park, mostly of the classical public park variety - old trees, neat lawn and asphalted walks. A nice enough place for city people to air out. 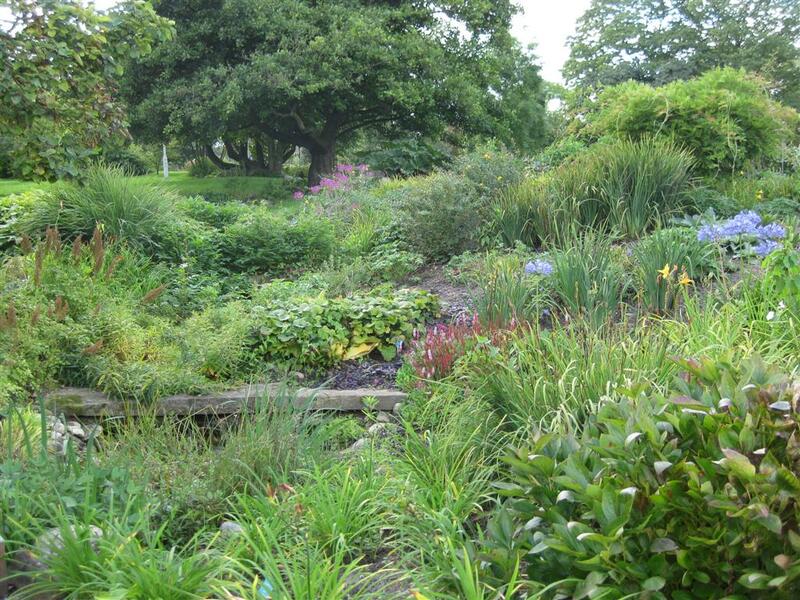 Some sections of the park were originally built for some kind of garden show. Of these there are some model gardens left over, that suffer from all the classical ailments of model gardens –impersonal, out of place, predictable. But never mind, because what I really wanted to see at Grugapark were the large naturalistic perennial planting areas. These were roughly in the middle of the park, somewhere between a very old fashioned rose garden (which, though not cutting edge gardening, did smell divine), and various sports fields. 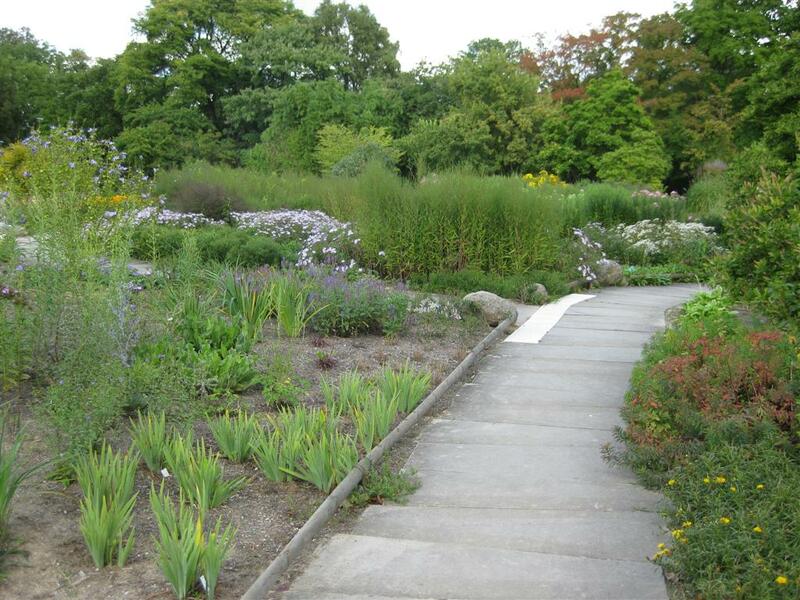 remarked on the lack of upkeep of public plantings in Essen in a recent blog. Garden maintenance is an interesting issue, and has been the subject of a few blogs lately. 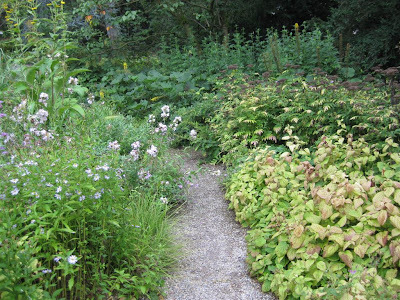 I think it’s great that many people are considering lighter approaches to maintenance, and working with the natural balance and spontaneity of the garden. 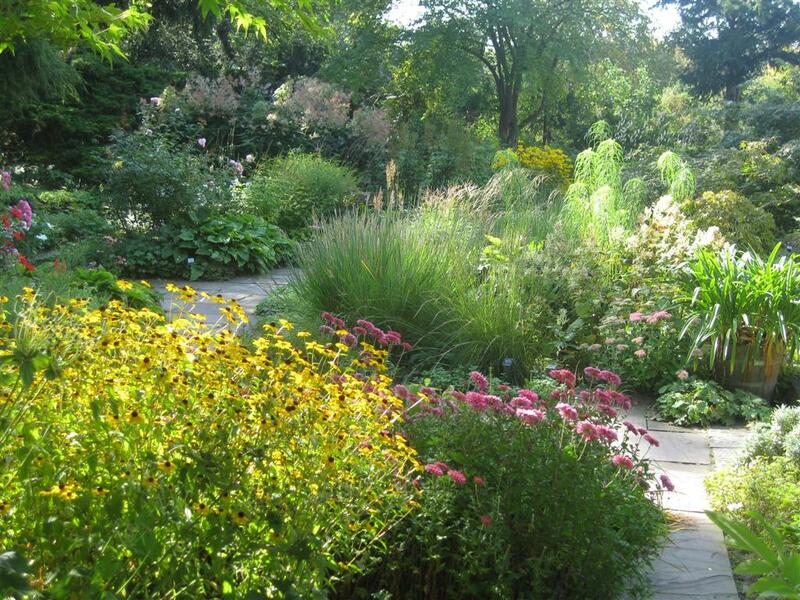 However, the very definition of a garden is a place created by humans, and some human presence is necessary to maintain the intent of the work. Sometimes very little is needed to do that, but somebody should still be on hand to guide the natural balance from time to time, and edit appropriately if that balance is not found. Otherwise, a garden can end up just looking disheveled and sad. 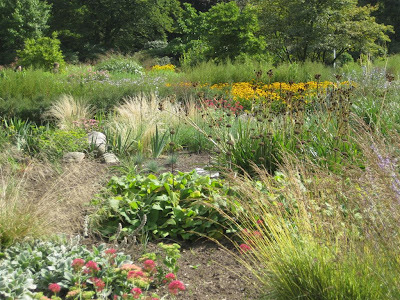 The good news is that some sections at the Grugapark perennial garden managed to achieve balance on their own, which was interesting to see and learn from. 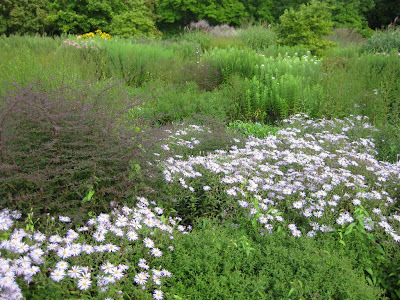 For example, the aster plant family really thrived in the local conditions. 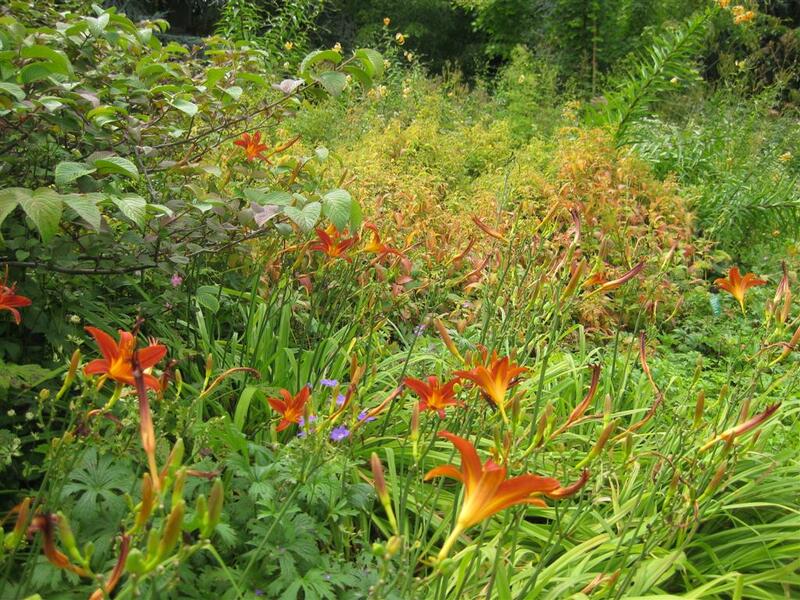 Many varieties flourished together, and nicely covered the ground while outcompeting invaders. 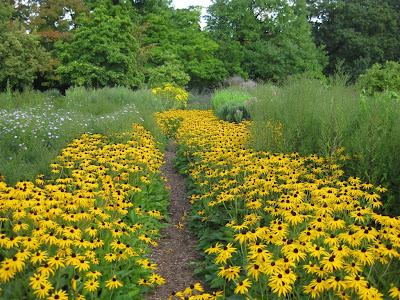 Unfortunately, my visit during the first week of September was a bit too early to see most of them in flower. 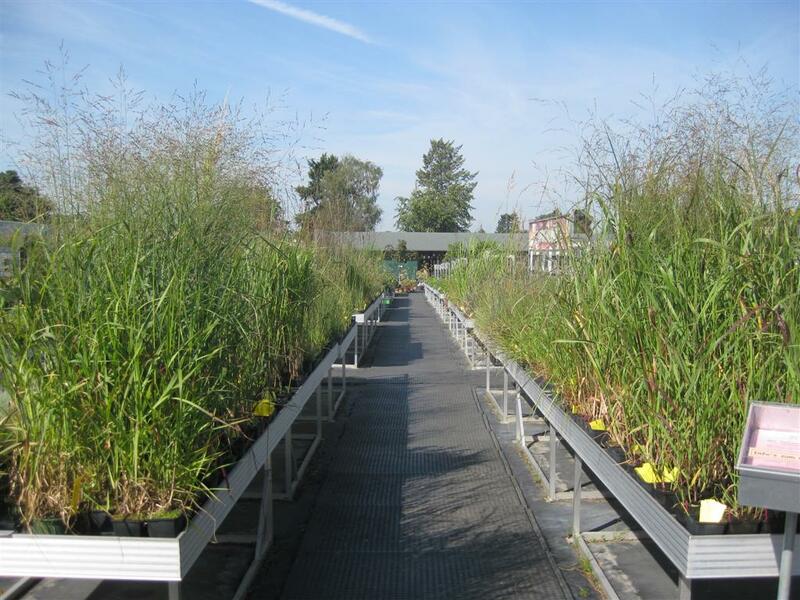 And grasses, the usual tough subjects, were also doing well, but I didn’t find their use particularly inspiring. They were planted relatively sparingly and often seemed lost in the large open space. Lastly, as often happens in life, the things we really look forward to can sometimes disappoint, but the unexpected can often provide a pleasant surprise. 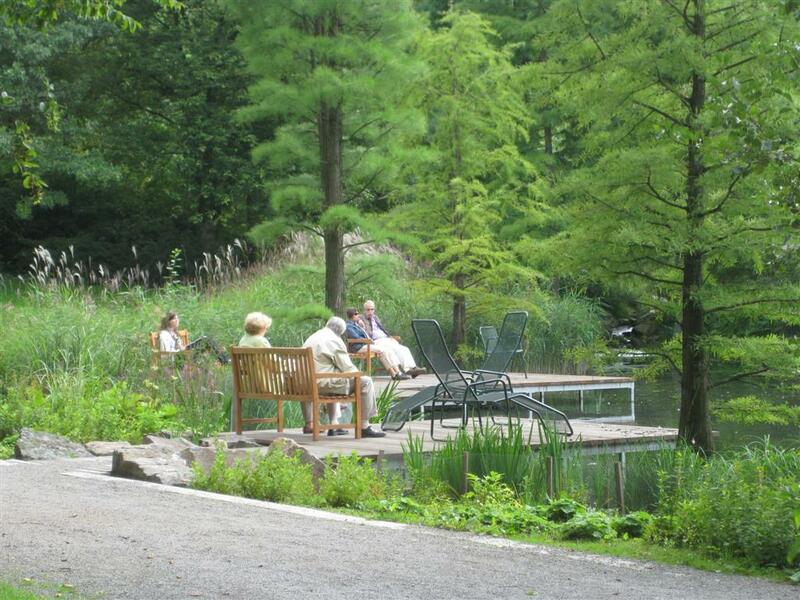 In the case of Grugapark, I most enjoyed a marsh and pond area on the far side of the garden. 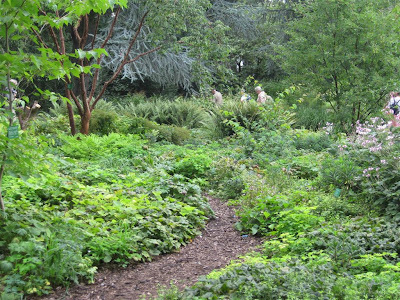 This section was mostly naturalized vegetation, hence circumventing the maintenance challenge altogether (the easiest solution – if you don’t have funding for maintenance, don’t make a garden that needs it). The lake was framed by a few very simple decks with chairs to sit on. 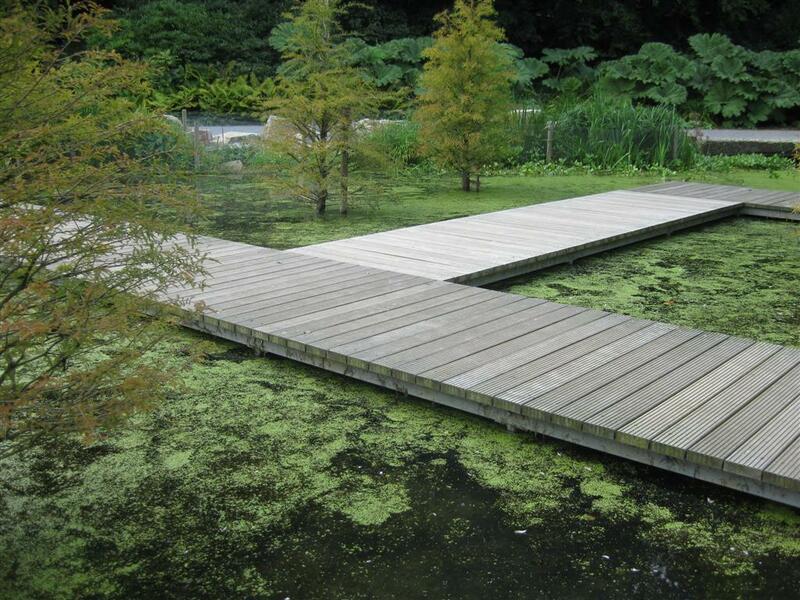 A geometrical network of boardwalks sitting right on the surface of the water provided a way to walk across the small pond. Most interesting were a number of swamp cypresses (Taxodium distichum) planted directly in the water. Not all of them were doing well, but some planted on slightly shallower ground were thriving. All in all, a very simple human made framework that highlighted the natural beauty of the setting and helped people enjoy it. I promise this is my last post on Hermannshof in Germany. 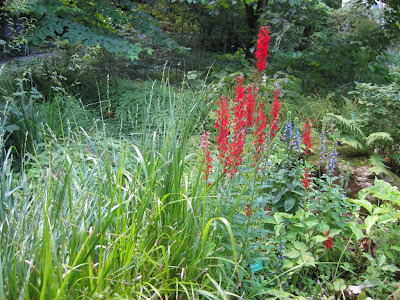 This is definitely the most cyber space I have used for a single garden, but there was just too much to digest in one blog. 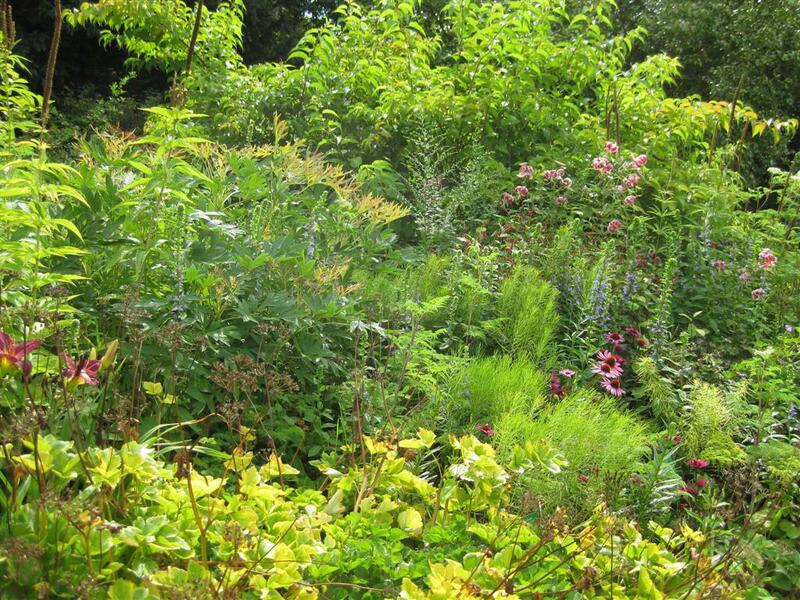 This last post is about the woodland garden, the small pond, and a long perennial bed of more classical composition which borders the central lawn. 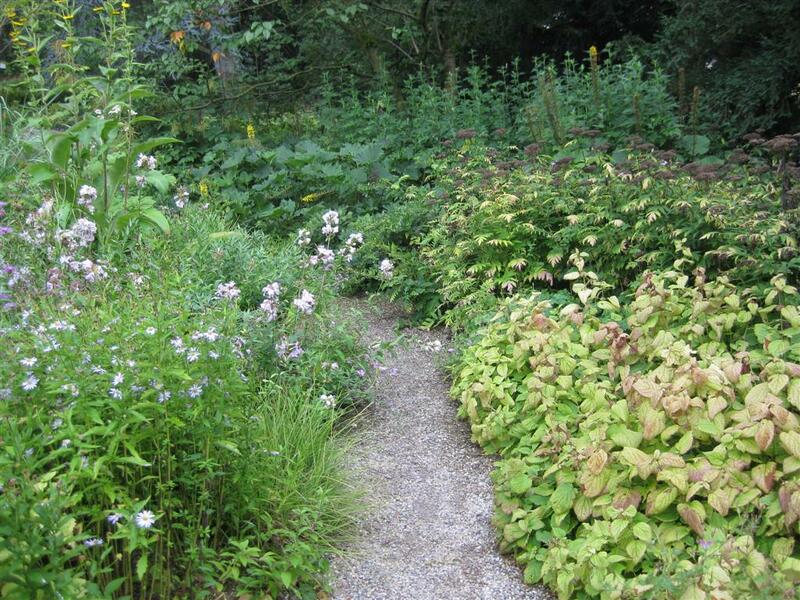 One of the goals of Hermannshof is to experiment with plant groupings inspired by different natural habitats, and that includes woodland. The park is fortunate to have many mature trees to provide a believable woodland backdrop, including massive specimens of dawn redwood, larch and tulip tree. 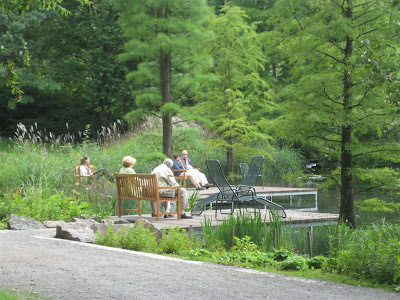 The open, sunny gardens gradually transition into woodland with some smaller woodland edge trees, such as magnolias and dogwoods, before being plunged into the deep shade of giants. The woodland sections are just as richly planted as the prairie gardens, and the fascination with North American natives continues. Various types of epimediums, ferns, sedges, hellebores and hardy geranium form a dense and complex tapestry on the woodland floor. One of the most striking plants I saw, and which I didn't know before, was Paeonia mlokozewitschii. 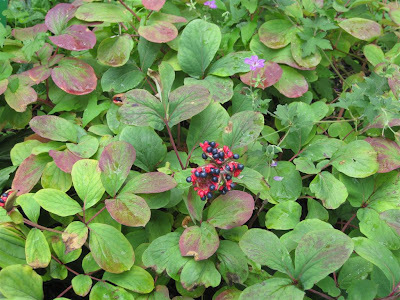 It was an eye catcher in a sea of green – prominent blue seeds in bright red pods, strong leaf shape and even some leaf colour at the beginning of August. 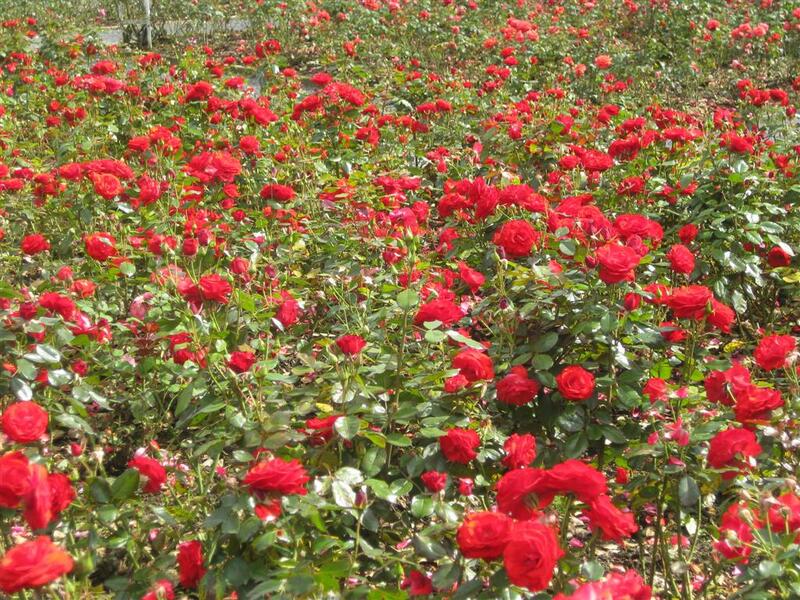 And that's just the after-show, since it flowers in the spring. One aspect of the woodland garden at Hermannshof which I found distinctive was the great number of grasses used, particularly in the edge areas. 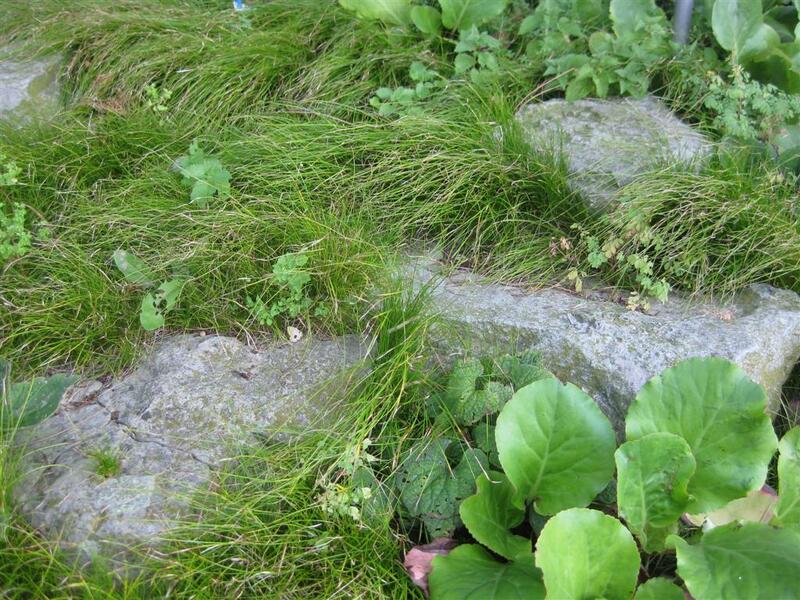 I noted Luzula sylvatica or Greater Wood Rush looking good (not pictured). There were also some showier perennials in the edge areas, such as Lillium martagon and Lobelia cardinales. The pond deserves only a very short mention, as it was placed in a rather awkward spot on the side of the great central lawn. It was bordered by lawn on one side, and wetland plants on the others. Although I didn't find it anything special, it was interesting to note that it was still a magnet for visitors, as water always seems to be. 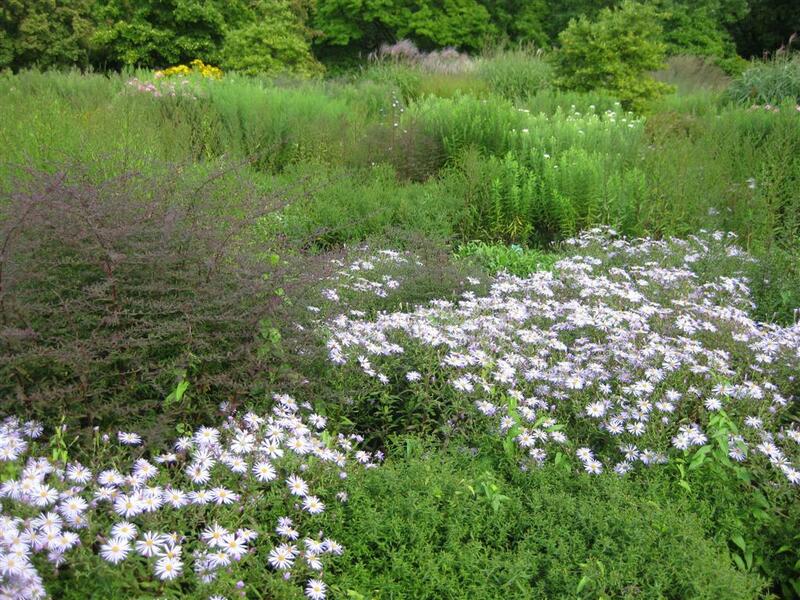 The last section I got around to was the perennial border on the woodland side of the great lawn. 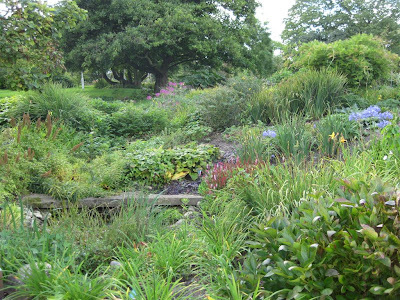 This is not accessible from the woodland garden, so you have to decide to walk all the way back across the central lawn see it. Part of this border used huge specimens of Hakonechloa macra to set up a strong rhythm, very dramatic even from far away. Further down, the plantings were more reminiscent of a classical mixed perennial border, but with some nice colour combinations which I think the pictures show off best. Well, that's it for Hermannshof. 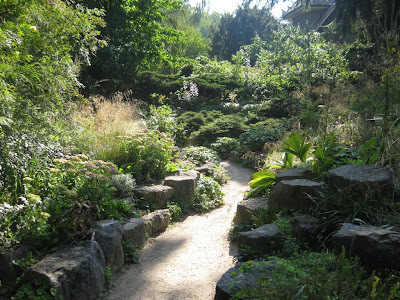 The romp through Germany continues next time with a garden which was, unfortunately, a bit of a disappointment... didn't think that was possible in Germany, did you?